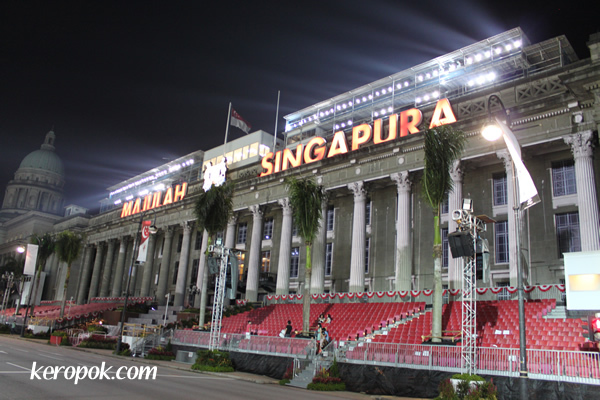 Majulah Singapura means Onward Singapore in Malay, the National Language of Singapore. 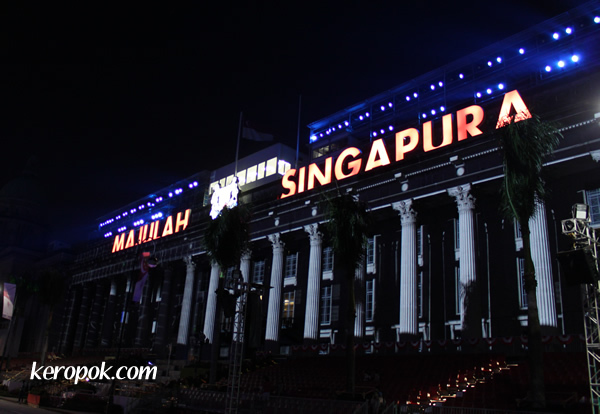 The "Majulah Singapura" signs had been mounted on the City Hall building as part of the National Day Parade Celebrations. For these few weeks, rehearsals have been on-going during the weekends. It's crowded. Oh, the lucky fellas who managed to ballot for the tickets! For today's photo, the above was when most lights were dimmed. The below was when the lights turn night into day! This might sound so wrong, but when I hear the Majulah Singapura being played on TV on Saturday mornings when I was a little boy, it means that TV broadcast has started for the day and it's cartoon time! You are rather thoughtful to your readers to show both with lights and without :-) Thank you. When does your National day fall on? In the day, it looks rather different too!